Golfers now have the chance to experience the longest continuous stretch of ocean holes in Hawaii with the re-opening of the Kiele Moana Nine at Kauai Lagoons Golf Club. A 27-hole facility operated by Marriot Golf, Kauai Lagoon is located in Lihue, Kauai, and allows golfers to tee off in style while enjoying stunning views of the ocean. The design for the Kiele Moana Nine was overseen by golfing legend Jack Nicklaus and saw the addition of three new holes to the course's back nine. The upgrades include TifEagle putting surfaces as well as white silica sand bunkers. 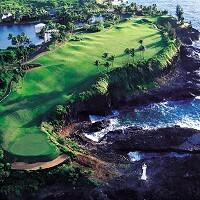 Kauai Lagoons offers an 18-hole signature Jack Nicklaus experience by pairing the Kiele Moana Nine with the Kiele Mauka Nine. It was named one of the best 125 Golf Resorts in the US by Conde Nast Traveller magazine in its April issue. However, action-minded travellers should ensure they have a comprehensive sports travel insurance policy before embarking on foreign journeys. Bill Nault, Vice President of Marriott Golf said: "The Kiele golf experience is legendary for locals and visitors to Hawaii, and we are thrilled to introduce an inspired layout that will make the experience even more memorable."